Samhain is my favorite holiday and time of year. With this year’s Samhain: The Four Chambers Ritual Set, we are unlocking and walking into the depths of the four chambers of our hearts. The heart … isn’t it a resplendent, mighty, and powerful thing? And yet, in its chambers lie secrets, past hurts, broken promises and dreams, and grief in need of some healing and release. This year, we will work intimately with our hearts in discovering and honoring what has died in us – facing it, properly releasing it, and creating the space for new intentions to be born. We will feel into what we need and ask our ancestors and spirit luminaries to guide us in setting the intentions that are best for our lives. 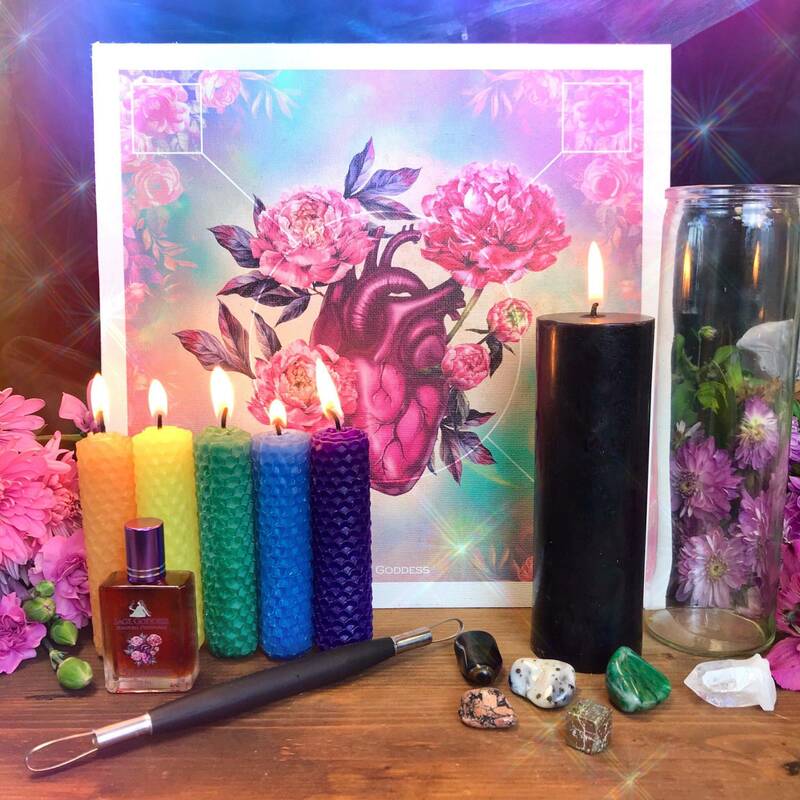 The tools in this Samhain: The Four Chambers Ritual Set were intentionally crafted and created to bring you closer to the messages of your heart. What must you let go of? What concerns will you bring into the Veil for a greater understanding, guidance, and wisdom? 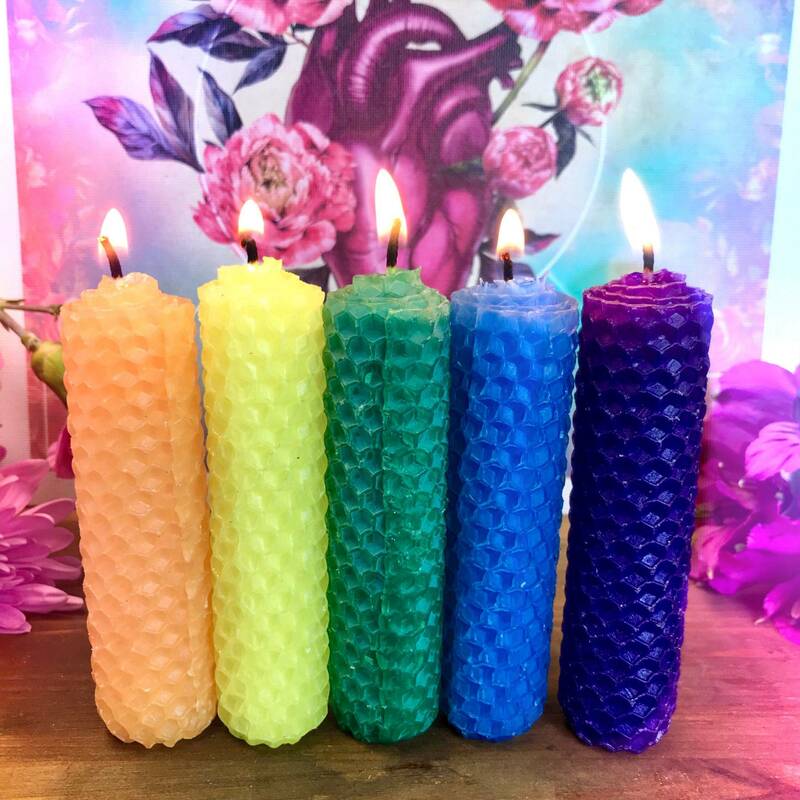 With this set, you will choose one colored beeswax candle with each color representing a different intention (purple for spiritual development; blue for authentic truth; green for emotional healing; yellow for power and strength; and orange for creativity). Additionally, you will receive a candle for carving to use during my Samhain ritual, a carving tool, my new Chambers Perfume, a beautifully designed canvas grid, and a five-piece stone set. Let us honor, return to, and uphold the Old Ways with this Samhain: The Four Chambers Ritual Set and bring individual and collective healing to our modern world in the process. 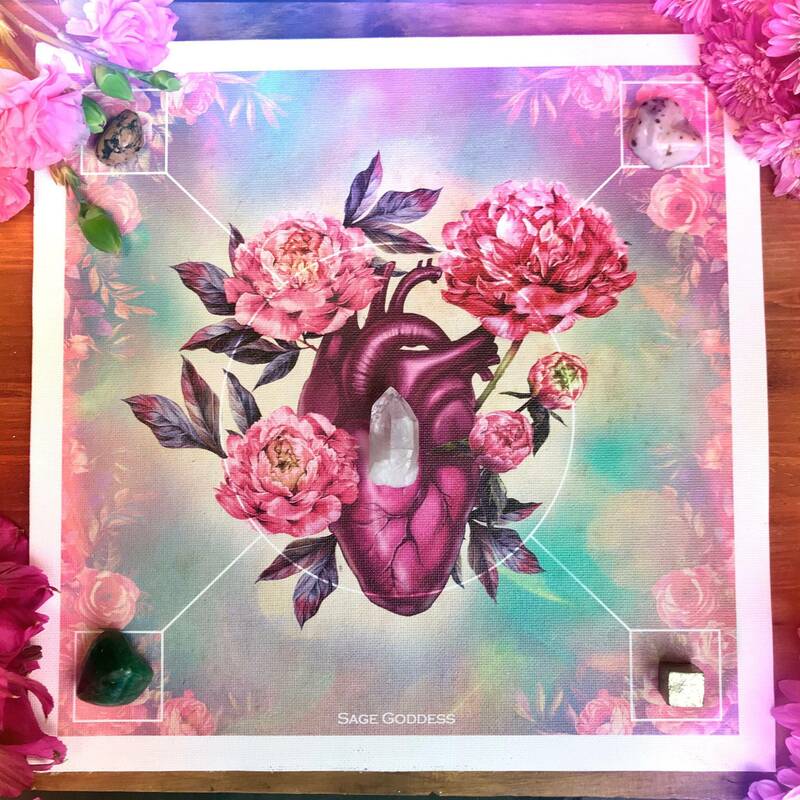 This year’s Samhain: The Four Chambers Ritual Set is inspired by the four chambers of the human heart. The number four is a symbolic number that is repeated throughout nature and seen in the greater order of the Universe (four seasons, four directions, four elements, four cardinal points, etc.) This order is also seen in the workings of the heart. In the body, all four heart chambers must work together in the right timing for the heart to pump blood efficiently. This reflects balance and our daily challenge in achieving balance in our lives. The spirit realm gives balance to our physical one, just as our physical world balances the spiritual realm. You cannot have one without the other. As above, so below. As within, so without. 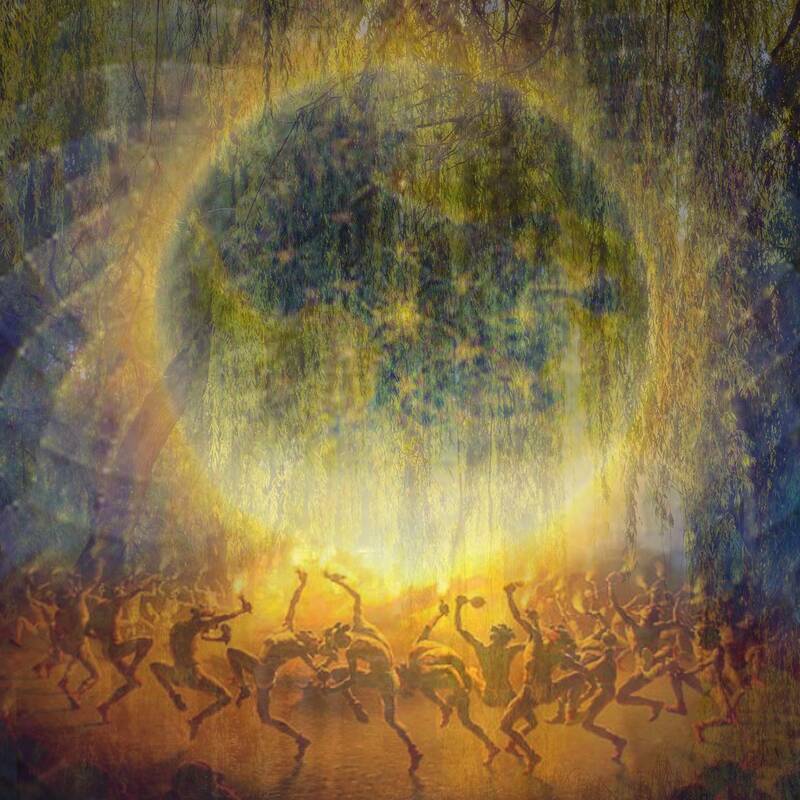 It is during Samhain that we honor the dance between both, connecting with our loved ones beyond the Veil so that we may live more balanced, more powerfully, more authentically, and more holistically. One (1) mini beeswax candle (about 4” in size). You will receive one colored beeswax candle of your choosing – each color corresponds with a specific intention: purple for spiritual development, blue for authentic truth, green for emotional healing, yellow for power and strength, and orange for creativity. You will use your beeswax candle to drip onto your carving candle, also included in this set. Please select from the drop-down menu the color/intention you desire. One (1) candle for carving (about 2×6” in size). This black candle is for carving with me, during our Samhain ritual. You’ll carve any sacred symbols you receive during this year’s meditation ritual. Each candle for carving comes with a glass container to burn your candle in. This is very sacred magic done in the Old Ways. One (1) carving tool. Work with this traditional carving tool during my Samhain ritual to carve symbols into your candle. The tools may vary in shape, but they will all carve your symbols beautifully. One (1) 15 ml bottle of my Chambers Perfume. This earthy and beautiful blend is handcrafted right here at Sage Goddess using 100% essential oils of rosemary, vetiver, palo santo, and bay. 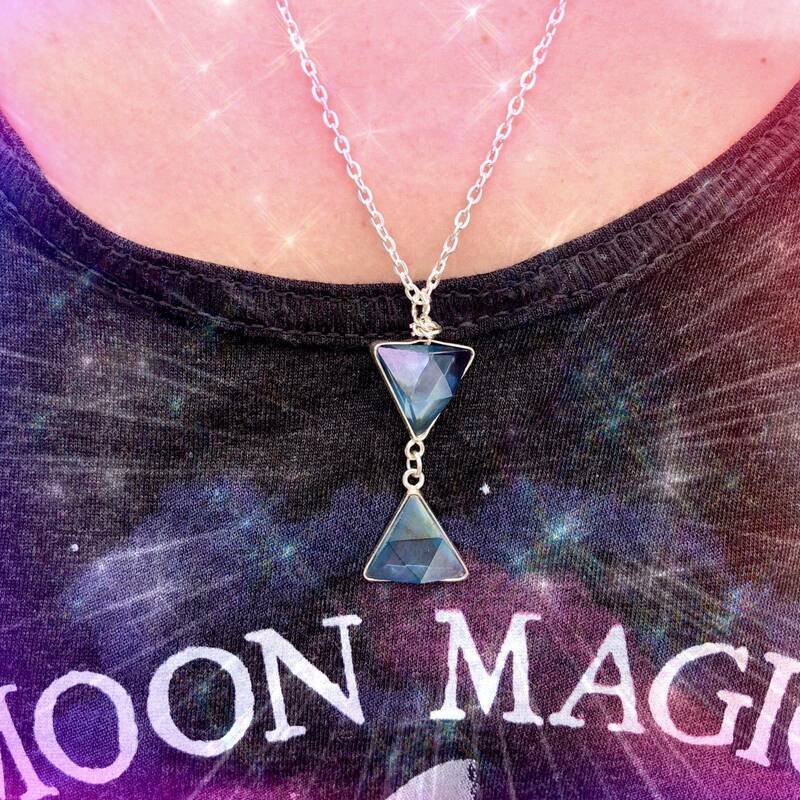 Each bottle is infused with a smoky quartz chip stone for grounding and protection while doing your work in the Veil. One (1) canvas grid (10×10” in size). Beautifully designed and printed right here at SG, this canvas grid features a lovely image of the heart and its four chambers. 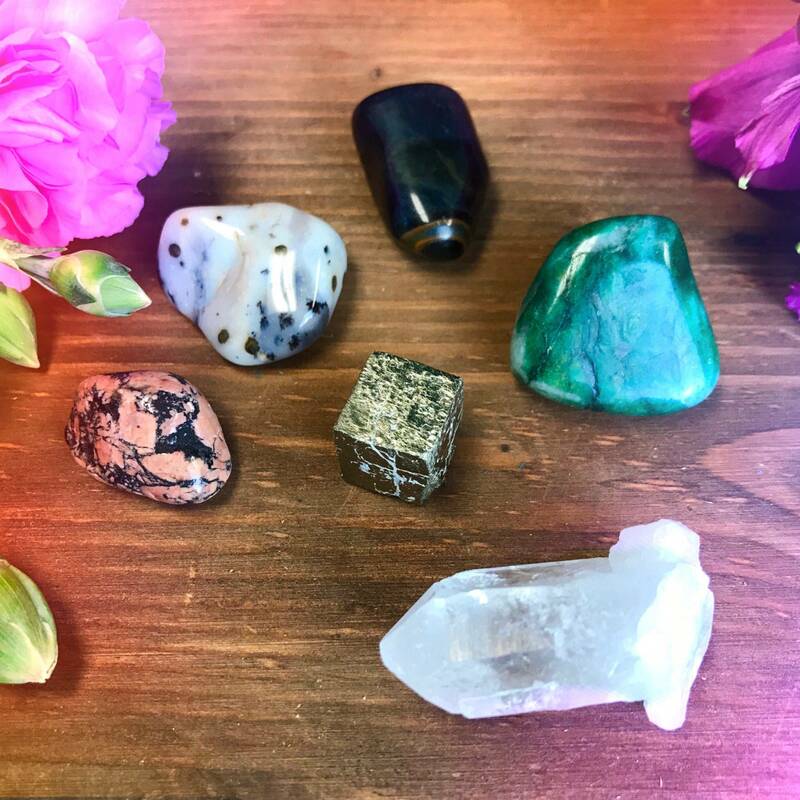 Use this canvas grid during our meditation and work with the accompanying stones to bring forth more healing and protection as you do the work within your heart and beyond the Veil. One (1) stone set (about 0.5” each stone). You will receive six stones in this set — one tumbled blue tiger’s eye for powerful shamanic journey work and vision questing; one tumbled luxullianite for stability within, balance, and harmony; one tumbled verdite (buddstone) for stability in the physical realm and connection to ancient wisdom; one tumbled dendritic agate for grounding, deepened connection to our ancestors, and abundance; one pyrite cube for self worth, abundance, and power; and one clear quartz point to amplify the magic of your other stones. Let us heed the medicine and magic of Samhain so that we can lean fully into the work of living. 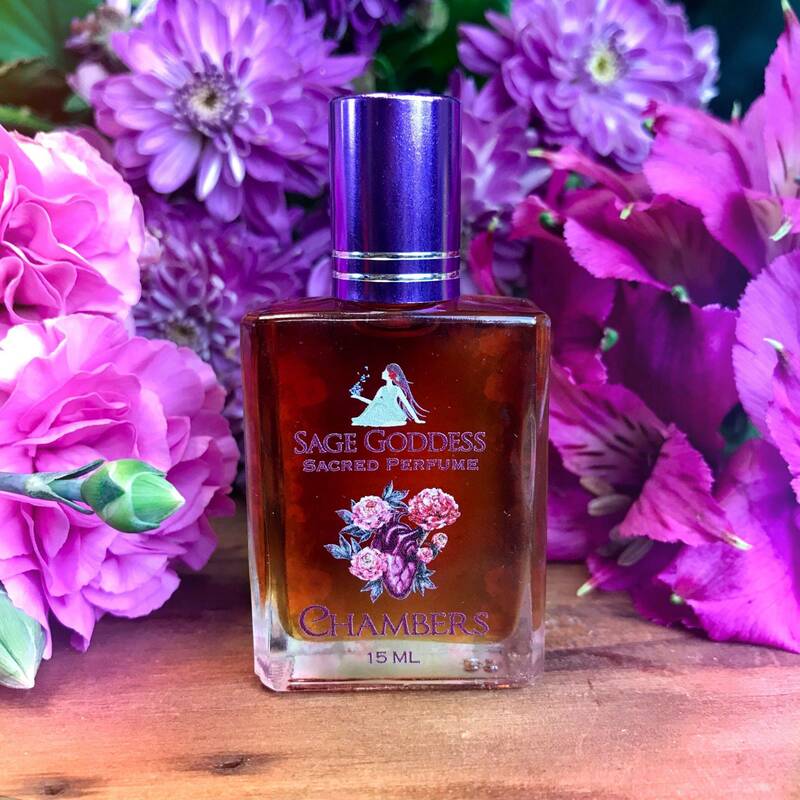 Note: My Chambers Perfume is made with natural essential and carrier oils, and may contain fragrance oils. Cap color, chip stone, and color may vary slightly. For external use only. Please always burn your candle on a heatproof stable surface, and never leave a burning candle unattended. This listing is for one (1) Samhain: The Four Chambers Ritual Set as described above. 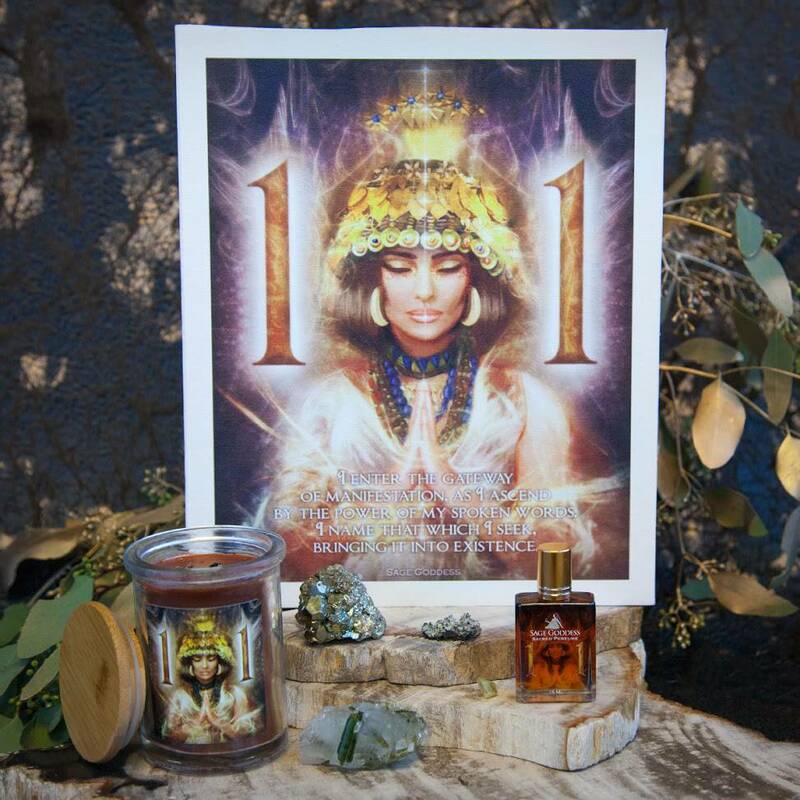 Please choose from the drop-down menu the mini beeswax candle of your choice – I have five options to offer you: purple (spiritual development), blue (authentic truth), green (emotional healing), yellow (power and strength), and orange (creativity). Your set will arrive lovingly parceled along with a single leaf of white sage and a parchment describing the properties of the stones. I love this set. Great artwork, and everything is right there for you to use. I love the sets that have a bit of everything and it makes the ritual process easier and the tools are always added to my collection for the future. What a great Samhain ritual kit. So much fun to craft on a high holiday. Excellent quality and intention for the New Year.